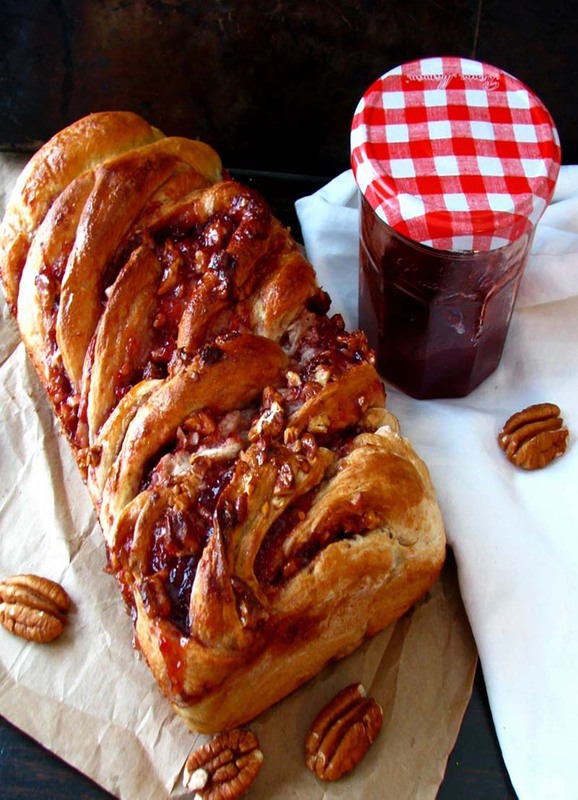 This sweet raspberry pecan bread is sure to add an elegant touch to your table. So tender, it literally melts in your mouth! In a medium bowl whisk yeast, warm water and sugar. Set aside until foamy. Once yeast has proofed, add 1 cup flour and salt. Mix with dough whisk or large spoon. Mix in remaining flour, ½ cup at a time. At this time you will probably need to use your hands. Knead dough on lightly floured counter top until dough is soft and elastic. Place dough into a lightly greased medium mixing bowl. Cover with a clean tea towel and let rise in a warm area for about 1 hour, or until it has doubled in size. Once doubled in size, punch down and place on a lightly floured surface. Roll dough out to about 10x20-inch rectangle. Carefully, spread jam on dough leaving about ½ inch around the edges. Sprinkle pecans evenly on top of jam. Roll dough tightly, starting at the 10-inch side. Seal the edges down as you go. Using a sharp knife cut down the middle of your roll. Carefully, braid (twist) the two pieces of dough – this will be a little messy. Tightly seal the ends together. Gently place twisted dough in a lightly greased loaf pan. Cover and let rise for 30-45 minutes. Bake bread for 55 minutes, or until bread is golden brown.